White gold, platinum and unique details are the strongest current trends, says head jeweller of Larsen Jewellery, Gillian Kilgour. 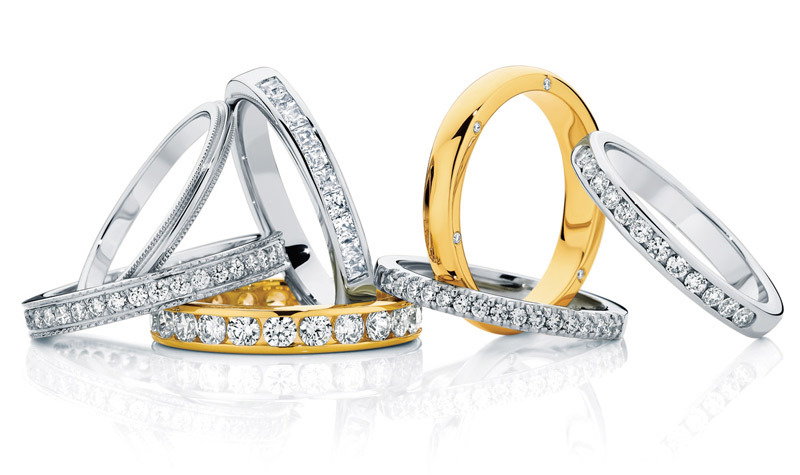 Traditional yellow gold wedding rings have taken a back seat to sleeker, more modern varieties with an individual twist. White gold wedding rings are popular, as is platinum, says head jeweller and manager of Larsen Jewellery, Gillian Kilgour. “Fine bead settings, where small diamonds are set all around the ring, are also very pretty,” she adds. Of course, every bride could do with a touch more bling. “I get a lot of requests for split wedding rings, where two rings are made to sit either side of the engagement ring,” Gillian says. Above all, though, the significance of your wedding ring should be at the forefront and that’s exactly why Larsen Jewellery offers couples the romantic experience of handcrafting each other’s wedding rings under the guidance of an experienced jeweller. “You literally make them yourselves! Any design is possible, including adding diamonds and engraving, and fitting it with an engagement ring is no problem,” Gillian explains. Always make sure your wedding ring matches perfectly in colour and style with your engagement ring. Don’t make your rings too light-weight – they have to last you a lifetime and become heirlooms for your children. Making your own rings ensures quality and gives you a lifetime of memories, too. Remember the rings are one of the few things that you will still have after the wedding day, so don’t compromise on quality. Make the rings as unique as your relationship – do something different. Fine bead-set rings, with inset diamonds. Split wedding bands, to keep the symmetry of your engagement ring. Mokume Gane men’s rings, where two coloured metals are mixed together creating a wood-grain effect. Hand-engraved rings, with a personal saying or line from a poem or song engraved around the outside of the rings. Having a secret engraving on the inside of the rings – but you have to resist the temptation to look before the wedding day!